This print is based on an old photograph of my parents from the year they were married. My father was in the army and the photo was taken in their hometown of Asheville North Carolina although they lived on the West Coast that first year in army housing. This is a relatively new medium for me-- screen printing. The registering of the colors is a bit difficult, so I was going for a bright cheap holy card look so that if it turned out a bit fuzzy, I could salvage a few with the rationale that I was going for the clumsy quick print look. It turns out they lined up pretty nicely after all. I referenced Our Lady of Guadalupe (and a thousand other iconic Madonnas) with the position on the crescent moon and framed, not in a halo, but flames. I'm not exactly placing them in hell although as young teenagers married too soon they saw their fair share of hell. 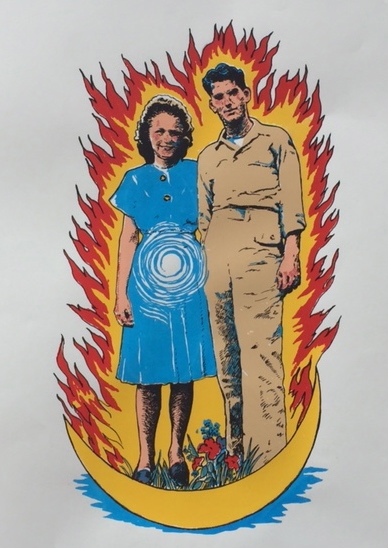 The flames are the all encompassing halo of carnal passion and the spiral in my mother's Blessed Mother blue dress is the spiral of life growing in her womb. I call it Boom Baby Boom as they represent the beginning of the post war baby boom and, in microcosm, their own private baby boom that progressed through thirteen children. The title also echoes the epithet "Burn, baby burn" from a few decades later after the Watts riots in LA. That particular reference doesn't relate to my parents personally but the suggestion of fire, anger and self destruction in the face of powerlessness is apt. Here are the film color separations. There were five colors printed with white the paper. Spread out on the drying racks. Touching up a few glitches where the red flame didn't print. I also touched up Mama's milk mustache that is still seen here. The blue on this print is slightly off-- too much to the right. I was going to toss it but Roni Henning, the master printer in the studio where I print, showed me how to delicately scrape, paint and fill in to make it all work. It's been great working with Roni. I was struggling with my five color separations and she used to print 27. 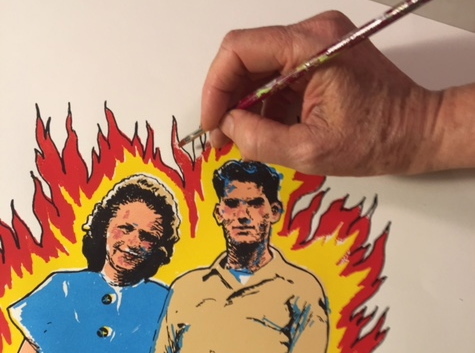 She literally wrote the book on non-toxic water based screen printing and has printed for Andy Warhol, Romare Beardon, Red Grooms, Alice Neel and so many more. She is also the most down to earth person you could imagine. Also, her father played violin and the young man that is my father in the image above was a bluegrass fiddle player.